In this article, I want to discuss the question: tripod or no tripod? Should I use a tripod for photography? The above picture is what happens when you don’t use a tripod on a long exposure. Tripods are a three legged stand that you can attach your camera to, so it stays put on the tripod. They are very useful for a range of photography and video situations. I’ve done several Youtube videos that wouldn’t have been possible without a tripod, because they stray from my usual camera setup, but I rarely use the tripod for photography. Should I use my tripod more? It got me thinking about when is an appropriate situation to use a tripod, and when they’re just a faff. Here I want to share my thoughts about when it’s a good idea to use a tripod, and when it’s better to not bother. Add your own thoughts in the comments! 1. They steady the camera. If getting those horizontal and vertical lines is a challenge for you, then the spirit level on your tripod can be a fantastic tool, because you can just adjust the legs until you get a perfectly level picture. A lot of lenses these days have image stabilization but nothing beats a good tripod. I’ve said it before, but if you know how to take a good picture first time, it saves a lot of lost opportunities. 2. Your hands don’t get tired. Holding a camera in an awkward position while you wait for the subject to get arranged can really tire your hands out – and hand shake is the enemy of a good picture. 3. Essential for longer exposures e.g. astrophotography. You literally cannot hold a camera still enough to get 30 second photos of space, unless you don’t have a heartbeat. 4. You can spend more time setting up the shot to make sure it’s perfect. If your camera has a movable viewfinder, you can leave the camera in place and check whether everything you’ve arranged is in-shot. 5. You can learn how to compose the perfect shot. This will probably improve the quality of your future pictures. Pictures taken with tripods tend to come out either very static or very dynamic. There’s no way to really compose the perfect dynamic shot (e.g. sports pictures) because the subject is generally moving independently of the photographer’s control, but for static shots, having a tripod can help you practise framing and using different focus techniques (for example) on the exact same shot to see what works and what doesn’t. This enables people to take pictures, and get a good shot without needing anyone to hold the camera, e.g. for family portraits. 1. They add weight to your setup. Especially the ones that extend enough for you to stand up straight whilst using them – when you add a dolly (wheels) you’re looking at even more weight, and soon you’re going to need a trolley to cart it all around. There’s a reason cameramen tend to have very strong arms! 2. They add money to your photography expenses. Granted, you can pick up a tripod for pretty cheap on Amazon, but it’s still another thing to pay for, on top of all the other things you’ve already paid for, and some people simply don’t have the money for a tripod. 3. The ones for outdoor shots tend to be bulky. The flimsy cheap ones can blow over easily (or get knocked over) if you’re not careful because they’re too top-heavy; would you risk a $1000 (often significantly more) camera and lens combo on a $20 badly made tripod? This comes from not snapping pictures whilst holding the camera, and it can lead to poorer quality pictures without the tripod. Some pro-tripod people don’t even believe it’s possible to get good pictures without using a tripod! I have just one tripod, a medium sized one of moderately good build, but I think there’s a time and a place for using it – I generally use it in my house or for astrophotography, as I said. When it warms up, I’ll start using it for infrared photography as well. I’ve never taken it up a mountain with me and I’m not sure I ever would (although who knows what the future holds). I’d like to play around with it more, but the weight is off putting because my camera setup is already fairly hefty. What do you think? When do you use your tripod? Are there any times when you would say it’s essential? Author MsAdventurePosted on March 11, 2016 March 11, 2016 Categories photographyTags advice, astrophotography, composition, cost, do I need a tripod, expenses, expensive, guide, hand shake, hands, help, how to, ideas, infra red, infra red photography, IR, IR photography, landscape, level, money, opportunity, outfit, photo op, photographs, photography, photos, pro-tripod, pros and cons, self timer, set up, setup, shake, shaking, shaky, shot, should I buy a tripod, steady, tips, tripod, tripods7 Comments on Tripod or No Tripod? I struggled to write an introductory paragraph for this post on choosing wedding rings, buying them, etc, but I hope this post is helpful for anyone struggling with decisions such as: “Is it okay to buy a second hand vintage wedding ring?” Or: “Is tungsten carbide a good material for a wedding ring?” The answer is yes to both, by the way. My ring was £249.99 from a Vintage/2nd hand shop in Bradford. It is platinum and 1/2 carat diamond (round cut) solitaire in size J, because I have tiny fingers. It took ages to find because a) A lot of jewellers don’t stock my size b) I was very indecisive. I looked at a lot of things and I fell in love with an antique 1920s ruby ring that was sadly sold before we could afford to buy it (I’m glad, though, now) and later, I nearly bought an opal and 9 carat yellow gold dress ring (5 opals in a row). The reason I didn’t (I was literally on the payment screen) was because I realized I have to wear this ring every day. Every single day. So I needed it to be fit for purpose. Opals have a big drawback – their beautiful colours are caused by water trapped under the surface of the stone. If you get them wet over a period of time, that water comes out and you are left with something that looks like a white plastic bead (I should know, I have a lot of opals in my crystal and mineral collection). This means I would need to take my ring off like, all the time (I wash my hands a LOT and I do all the cleaning in my house). That wasn’t what I wanted to have to do with my wedding ring. Additionally, I wanted something that looked equally at home if I was wearing my ripped denim jacket or my beautiful wedding dress. I needed something neutral, that looked good all the time. So I chose a diamond, and I chose a silver metal for travel reasons – if I’m travelling, chances are, people will disregard it as a silver/cubic zirconia ring and not worth stealing. An advantage of it being second hand is that its recommended retail price is £1700, so someone else absorbed that depreciation, and another advantage is that there’s less pressure on me, as it’s not perfect or pristine, just like me (not that you can tell from glancing at it). Taking the pressure off the bride was the only way I was going to walk down that aisle, so YAY. Before this, I had an engagement ring made of white gold, diamond and tanzanite, I got it for about £39.99 from Argos on offer, it went up to over £79.99 and stayed there for years, and I don’t know if they’re still selling it. We got engaged in 2011. My future husband chose a tungsten carbide alloy ring with the “One Ring” inscription from Lord Of The Rings. It’s durable, it was cheap (like, under £10), and he assures me that it is comfortable to wear. 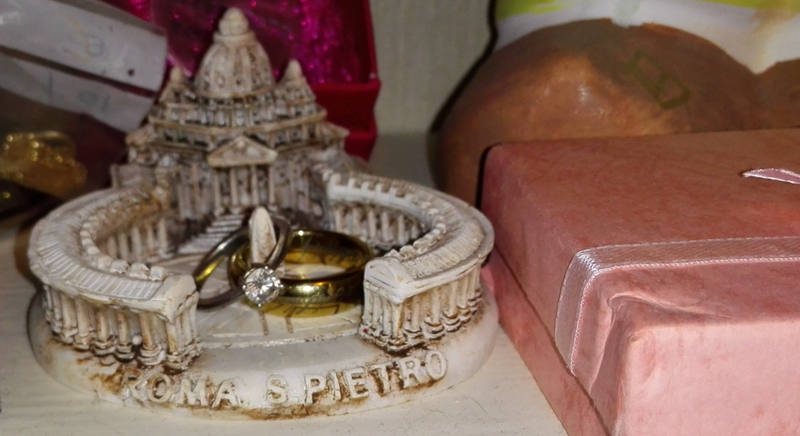 He doesn’t generally wear it; he seems to struggle with rings, and I think a lighter ring would have been easier for him to keep on his finger, but he wanted this one, so most of the time it lives on the mantelpiece in our living room. His engagement ring was £19.99 from Argos; it was stainless steel with a Greek key pattern on it. Our wedding rings. If you squint you can see the inscription on his. Would you buy a second hand or vintage wedding ring? Let me know in the comments. Is Fear of Leaving Empty-Handed Making You Shop? Have you ever gone into a shop and browsed, only to feel like the woman behing the counter is watching you, and like you can’t leave empty handed? That compulsion to buy something? It can get a bit ridiculous. When I first left home, I had to know what was inside every shop, I think it was just curiosity and an enjoyment of the time I could spend doing it. However, I seemed to keep leaving the shops with an item or two. Sometimes three. Sometimes these items were fairly expensive. Always I didn’t want or need them. I couldn’t understand why I kept doing it until I got stuck in a particularly cloying boutique. It was the kind of shop that calls itself a boutique, that sells things which are labelled in squiggly handwriting with the name of some unreadable (and unremarkable) “designer.” The window display had been some pretty hats, and for some reason it lured me in. I wondered what else they sold. I went inside. A particularly sour-faced older lady in the over sixty category, wearing a very unattractive floral print dress (prints had been out for about 10 years by this point, and wouldn’t ever make a comeback in the garish incarnation she was sporting) and a necklace that seemed to be garotting her neck fat. She glared down her nose at me and didn’t say a word. I looked around to see what the shop sold. There was a lot of things that the older lady might wear to watch a regatta or go to a wedding. I could see the Queen shopping somewhere similar. Nothing had any price tags on. I started to panic because there was nothing in the whole shop that I could buy. Not a single thing. Everything was repulsive in some way or another. I felt too hot, the temperature was stuffy and the artificial floral air freshener was catching in my throat. I wanted to leave, but I couldn’t buy anything, so I looked obsessively at every single item, pretending to be interested, and I had an epiphany – I didn’t have to buy something in order to leave. The exit was right there, all I had to do was be brave and walk out. I suddenly realised that when I came into shops like this I tended to worry that sour older women like that would just see my school uniform and assume I was shoplifting when I wasn’t, causing unpleasantness. She couldn’t stop me for shoplifting – because I hadn’t shoplifted anything. It didn’t seem like such a silly worry at the time, so I had to take a very deep breath, close my eyes, pull the door open… and I was back on the street, walking away, never to see the inside of that awful place again. I felt like I’d escaped from a spider web. For years, I felt very uncomfortable when trying to leave a shop without buying anything, although it wasn’t unmanageable. I did still find it quite difficult, however, and there were a few times I ended up leaving with something I thought I wanted to buy, but if I’d really thought about it, I wouldn’t have bought it. It all came to a head in my first year of university. I’d just got my student overdraft, and I saw a dress in the window. It was sparkly and pale pink. I went inside to try it on. It didn’t fit particularly well and it had a huge design flaw that made my legs look terrible. Additionally, it was actually a very unflattering pale peach, and made my skin tone look dead. Oh, and it was also £250. But do you know what I did? I bought it anyway. I didn’t find out about the colour until I got back to my room; they must have had some very odd lighting on it in the shop. I got it home still feeling really pleased with myself about buying the dress, pleased that I was now the sort of person who could spend £250 on a dress without thinking about where that money would come from. Pleased, in short, that I was able to participate in consumerism at a higher level than when I lived at home. I equated spending power with success. It was about seven or eight years later that I finally realized that I had made a poor choice. The years came and went, I never actually wore that dress to any of the variety of functions I attended, at all of which it would have been appropriate, because I was afraid of someone spilling something on it, or standing on the hem. Every time I tried it on I would look in the mirror and feel very pleased with myself for having such a nice dress. Through the bad times, the times when I was working at McDonalds and when I was unemployable because I couldn’t walk, I would try the dress on and feel the same way I had when I bought it – like I was going places. I felt like anyone with a dress like this must be on their way up in life. I loved it. And underneath that thought process, I also hated it. I felt like it was a tangible reminder of my own weakness, my inability to not buy things, something I knew was a personal failing even as it made me feel happy. The feeling grew on me that I had never worn it, and time was always moving forward, and it was just taking up space in my life. I didn’t need it, and I didn’t want it. Every time I altered the hemline or changed the drop of the skirt, it still didn’t look right and I couldn’t put my finger on the reason. The bottom line was, it was an expensive waste of money and it was also an overpriced and poor fitting monstrosity that I would never have occasion to wear. When my wedding day came, I pulled it out. The most expensive dress you ever wear, we are told by the Wedding Industrial Complex, is supposed to be your wedding dress. Well I wasn’t going to spend £250 on a wedding dress, but I also didn’t actually like that dress and didn’t want to wear it in public. I think the peach colour had progressively faded from the moment I bought it and when it came to my wedding year it was a really yellowish peach that made me look positively anaemic (which I was, but I didn’t need to look like I was). My actual wedding dress was £10. When I first started minimalizing the house, six months after the wedding (we haven’t been married anywhere near a year yet), that £250 dress was one of the first things I got rid of. Do you know how good that felt? It felt better than when I bought it. I felt like I’d unhitched a cart that I’d been dragging behind me for years. I felt lighter and more moveable. It’s several weeks later and I’m still glad I got rid of it. The fact that I was able to get rid of it means that I am putting that part of my life – the naive thoughts that being able to consume more expensive items equates to success and happiness – behind me, I’m committed to minimalizing my life and letting go of the things that are weighing me down. All my sandbags will be cut loose, so I can soar amongst the stars. No longer am I afraid of leaving empty handed. I don’t need to buy things to prove to shop assistants that I have spending power. I know that I can buy anything I want to, but that doesn’t mean I have to use that power. In Kung-Fu, it is taught that true wisdom is knowing when not to fight. So in minimalism, we learn that true wisdom is also knowing when not to purchase things. I think this is probably linked to FOMO – or fear of missing out. Sometimes I worry that if I don’t buy something when I see it I’ll never get back to buy it when I really need it. This is an obstacle I’m still trying to overcome. But that’s okay, because minimalism is a journey, and it starts with choosing which pair of shoes to wear to take that single step. Unless you’re a centipede. In which case you can wear all of them. Author MsAdventurePosted on February 27, 2015 Categories WellnessTags buying, consumeriarchy, consumerism, decluttering, dress, expensive, FOMO, minimalism, minimalist living, shopping, spree, wedding2 Comments on Is Fear of Leaving Empty-Handed Making You Shop?